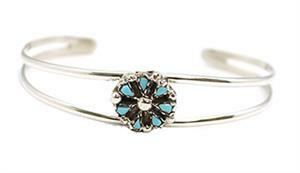 This sterling silver 2 shank baby / child bracelet has a cluster of tear drop shape turquoise stones in a flower design. Top measures approximately 7/16" diameter. Wrist size measures approximately 4'' with 3/4 opening. It is Zuni hand made by Trudy Kallestewa. Turquoise color shades may vary.